Thanks to all our loyal customers for their continued support. Special thanks this past month to Doug and Irv from the Chesapeake Bay Oyster Company for working with us to re-power one of their work boats. We really appreciate and value the local support and enjoy working with all our local businesses. As fall arrives, we all must think ahead and prep for winterization and storage. We have helpful information in the dealership. 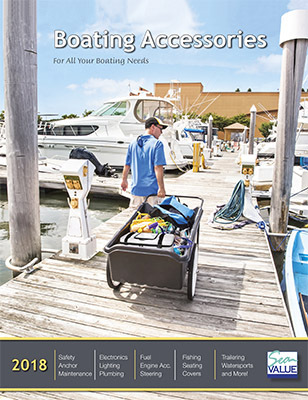 Stop in for a free copy of Yamaha’s “Maintenance Matters” and our own “Boating Accessories Catalog” — both are full of great information and products. Protect from freezing — anywhere water can collect is obviously a problem. Use common sense and drain freshwater tanks or protect with proper antifreeze. Check all compartments and make sure they can drain. When the boat is hauled and blocked or on the trailer, remove the drain plug from the boat. Take care of your engine — Inboard/Outboards will freeze. If yours is freshwater cooled, make sure the antifreeze is at proper strength. A raw water engine should be flushed and protected with antifreeze or at minimum drained of any water. Outboards should be stored vertically if possible as water will drain from the power head. Don’t forget your fuel system — We see more fuel related problems than any other issue. Most manufactures today recommend removing fuel from the tank if possible. Others suggest filling the tank 7/8-full and adding the proper amount of fuel stabilizer. Do not fill the tank completely, it’s important to allow for expansion and contraction from variations in temperature. Even with stabilizer today’s fuels do not have a great shelf life, this is especially true when the fuel sits in small areas like a carburetor. In this environment, small volume, exposure to air and temperature variation fuel will break down rapidly. We stock winterizing products from Yamaha, Honda, BRP, Suzuki and many aftermarket suppliers. Items like Yamaha Ring Free, Yamaha Fogging Oil, Combustion Chamber Cleaner, all Yamalube products both 4M and 2M even Yamaha oil change kits. Bulk Yamalube, just bring in your container and save! We stock Honda fuel stabilizer- one quart treats 320 gallons of fuel- an excellent solution to the problems created by ethanol. Other fuel stabilizers like PRI-G and K-100. BG fuel products like 44K. Gear case lube from Yamaha, BRP, Honda and Mercury, even gear lube pumps for the do-it yourselfer. Hope to see you in the store! Don’t forget the outside of your engine and boat either. We carry a wide variety of cleaners and protectants. Products like YAMASHIELD and Instant Detailer. For the best exterior protection we offer shrink wrapping. Call at 804-776-6365 for details!